Last year we moved to a new location with dedicated gaming tables, and will continue to grow our gaming presence as time goes on. With plenty of nearby food and beverage options as well as snacks and cold drinks on hand, and a generally casual-yet-competitive atmosphere, we hope you'll enjoy gaming with us at Ampdraw! Itching to open some packs and make a deck? Want to win a sweet trophy for your bookcase? Or just need to kill three and a half hours on a Tuesday night? 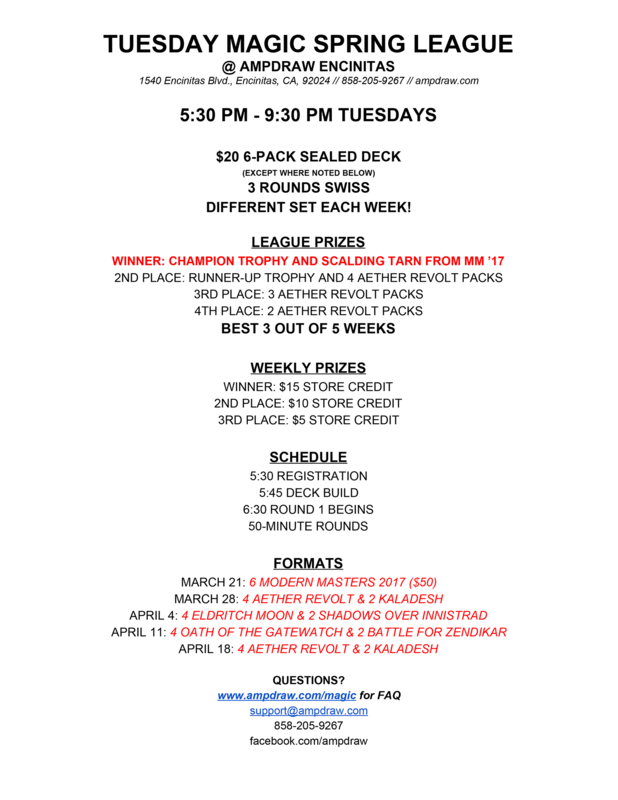 Check out our sealed deck Magic league, beginning on March 21 with a special Modern Masters 2017 sealed event. Click the flyer below for the details. Amonkhet Pre-Releases are Saturday and Sunday, April 22-23!